Divan bases are probably the most popular of all bed bases and come in a multitude of fabric colour/finish options . Divan bases are made specifically to take the weight of mattresses and provide an even consistent surface for you to sleep on. Quality divans are sturdy, well constructed, robust and add storage options in the form of drawers. They hide the issue with 'what is that under the bed?' as they sit a mere inch or two above the flooring. The drawers configurations enable storage away from prying eyes and they are neat and tidy to look at. A divan is a wooden box(s) that is then covered in wadding/padding and then upholstered in various fabrics. 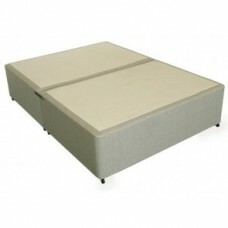 There are then two options for divan bases which relate to whether you want spring in it or for it to be a platform top. They come in one or two parts and take minimal assembly. Once they have been connected and a headboard added, that's it job done! 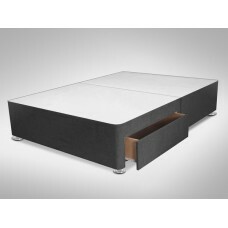 The Sterling platform top no drawer divan base provides a firm foundation for the mattress. It has s.. The Sterling platform top leg base divan provides a firm foundation for the mattress. It is 8" (20cm.. 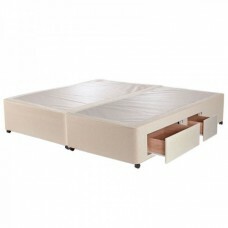 The Sterling platform top 2 drawer divan base provides a firm foundation for the mattress. It has st.. 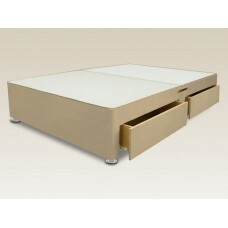 The Sterling platform top 4 drawer divan base provides a firm foundation for the mattress. It has st.. The Sterling platform top 2+2 continental drawer divan base provides a firm foundation for the mattr.. 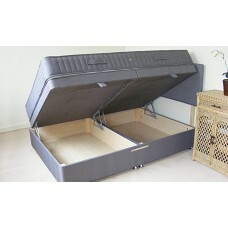 The half lift ottoman storage divan base has a gas lift mechanism which makes it extremely easy to l..